Lasers are an apparatus typically used in certain workplaces which can instantly cause harm and injure your workers. Below, you’ll find the risks that come with operating this device and controls that can help limit the hazards of lasers for workers. Lasers are becoming a more typical addition to equipment at some workplaces. Some workers are exposed just by supervising a laser device, and some just by being in an area where a laser is being used. It can reflect in unexpected ways on some surfaces that may cause the beam to strike at workers that are nearby. Laser light emitted into a worker’s eyes is dangerous. A low-powered laser can make a worker blink to protect their eyes which can cause a distraction and result in injury. More powerful lasers such as CO2 lasers can seriously damage the eyes even before triggering a blink response. Other injuries such as thermal burns can also be caused by lasers to a varying degree which depends on the power of the laser. Working with lasers requires training. A worker must be knowledgeable about the classifications of lasers and how they work, personal protective equipment to use, and safety measures needed in case of emergencies. A workplace with a Class 3B or Class 4 laser requires a laser safety program and the presence of a trained laser safety officer. 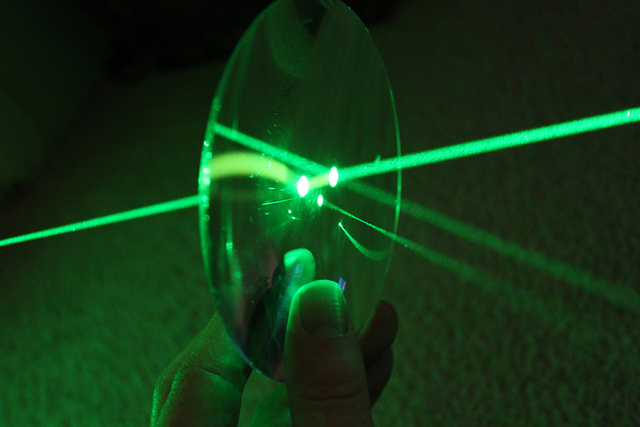 There are different controls that can limit the hazardous effects of lasers. The most effective will be to fully eliminate the source of the hazard, but if that’s not possible, there are other ways. Below, you’ll find the different kinds of controls arranged in order of effectiveness. Eliminate the source of hazard by replacing a safer process or equipment. Can a less hazardous method of cutting be utilized instead of using a laser? Physical alterations to the facility, machinery, and processes can lessen a worker’s exposure from the hazard. Can work methods get automated so that workers don’t have to get exposed to laser light? Can workers be shielded from laser light by installing barriers or enclosures? Administrative controls include changes to rules and regulations at work, distribution of awareness materials, and training workers. Is there an established exposure control plan that workers know about? Do you have a laser safety officer? Are there warning signs posted in areas where lasers are used? Because this is the least effective control, one of the previous controls should be used together with PPE. It is imperative that workers are always wearing proper PPE and that it is well maintained.